I was sooooo pleased when the guys at Sing My Name asked us to review a clock. I have a strange issue that some of you may envy, I have to drag my big kids out of bed most mornings! At 5 and 4 they are LAZY! please don't hate me too much though Termite still doesn't sleep so I'm not being spoiled by the gods of sleep. Our personalised alarm clocks are a fantastic gift that kids simply love. When the alarm goes off the clock sings a fun 'Wake Up' song which features the child's name as part of the lyrics! Children love hearing their name and our alarm clocks are popular with kids all over the world. You'll even find them being sold in prestigious UK stores, such as Hamleys and Harrods. These clocks make a superb personalised gift, perfect for Birthdays, Christmas, Christenings, or even to celebrate the first day of school. Teach your little one how to tell the time with the help of their personalised alarm clock. Kids wake up too early? Get them into a routine of waking up at the time you want, by encouraging them to get up when the clock sings their name. Have a teenager you can't get out of bed? Set a LOUD personalised song they'll love to hate or record your own funny wake up call. 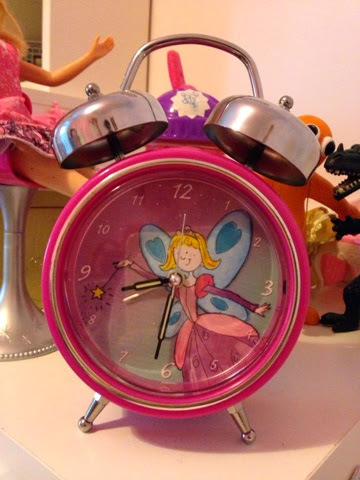 Our personalised alarm clocks are not only favoured by children - adults love them too. Are you looking for a fun birthday or retirement gift? Our personalised clocks are guaranteed to make adults laugh out loud, and they can even re-program the clock with their own music to make a truly useful gift after the joke is over. Peanut loved it when she first saw it, obviously it being pink made it a winner from the get go. I will admit I prepared myself for annoyance but actually the song is pretty catchy and very soon we were all singing it! We did have a little trouble when we set and switched on for a wake up at 8, but the kids went to bed at 7 so just as peanut fell into deep slumber she was awoken by the clock, poor thing has rarely woken anyway but naturally so the shock really scared her. I think that at 5yrs she may be a tad too young for anything more than mammy stroking her head as a wake up but she does love it. I like that you can plug it in with a USB Cable and re-programme it. But I think that at an RRP of £25 I would have liked to see batteries included. Overall this is a nice gift and It will last a long time, I think kids will really love it and actually we still sing the song sometimes so its obviously quite a catchy one! Now those lovely guys at SIng My Name would like to offer one of my lovely readers a clock of your choosing, so to be in with a chance of winning simply fill in the rafflcopter below. My little one would need this for school days, when I literally drag him out of bed...school holidays he does it all by himself...grrr! This does sound like a lovely idea, and my daughter would be happy with pink, too! But, as they get up earlier than I want them, too, they have no need for alarms! They're so pretty! Definitely no need for alarm clocks in our house as yet but I live in hope!